HOA board president Don Wildfang did not respond to an interview request. 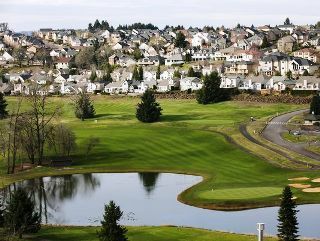 The golf course and neighborhood were developed together but have no legal connection, and most of the homeowners aren’t club members. Still, the association’s board objected to the developers’ plan to close the course, saying the lots they bought were advertised as being in a golf course community. In their lawsuit, filed in April 2016, they said the covenants, conditions and restrictions (CCRs), recorded in 1992, guaranteed that a golf course will continue on the property. The case went to trial in January 2017, and in May 2017 a judge ruled in favor of the club owners. The association has appealed, seeking to overturn the decision. It also is appealing the award of legal fees, said Chris Tingey, the association’s lawyer. In February 2018, Tokarski and Kelly filed a separate lawsuit against the homeowners association and each of its six board members. They say the board members, all of whom own golf-course-view homes, illegally used the association’s reserve account to finance the first lawsuit. That bankrupted the association, raising monthly assessments for other property owners, including Tokarski and Kelly, the lawsuit says. Creekside Golf Club has asked a judge to order the Creekside Homeowners Association to reimburse it more than a half million dollars in legal fees. The lawsuit asks the court to remove the board, put the association into receivership and order board members to personally repay the association for litigation costs. The golf club owners have put their development plans on hold as club members have worked to make the business more profitable.